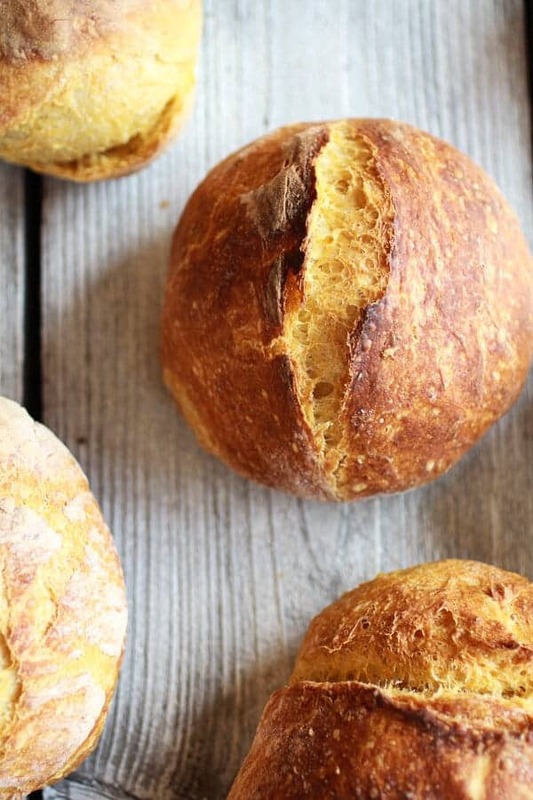 Have you ever walked into a house and smelled fresh baking bread? Oh my gosh, if you are nodding your head no right now than it is time to change that. Like right this very second. If you are not one of those poor unfortunate souls than you know that it is probably one of the coziest and most comforting smells there is. Well, I don’t know that might be a bit of a stretch. Cookies might just be a tad better, but cookies are different. Cookies are a sweet and totally different craving. Bread is savory and you get to eat it at dinner with warm soup, stews, meats – well really it can be eaten with anything. Or without anything, else that is, just toast it up with some butter. Personally, my favorite way to consume bread is dipped into soup. And I blame this one hundred percent on Panera. Yup, Panera and their stickin’ bread bowls. I was, no am a total sucker for them. When I was younger I always had to have the bread bowls whenever the rare occasion occurred that we actually got to go out for food. And trust me, it was pretty rare. Although, if you can believe it, it is actually even more rare now. I cannot remember the last time I actually went and got food somewhere else and I don’t even know if they have Panera’s in the west. We did used to get pizza delivered every now and then, but ever since we moved to Colorado that has never, like not even once, happened. In fact the last time we probably got carry-out was from either Hungry Howie’s Pizza or maybe BW3’s back in Ohio. Guys, that was like seven years ago. I think it is mostly because the food choices up here are actually not the best. Or at least they are not to my family’s particular tastes. Or my family is just pure cheap as ever and they rely on me as their personal sous chef. Yeah, pretty sure that’s it. Now that I think about it the carry-out kind of slowed down around the time I started cooking. Totally all makes sense now. Maybe I should start charging? What’s the going rate these days? Ah man, who I am kidding, that’s never going to fly. I guess I get free rent, so I got that going for me! Hallelujah! Anyway, these bread bowls are SIMPLE. Just mix some flour, yeast, salt, pumpkin purée, and water with a spoon. Let it sit covered overnight at room temp. 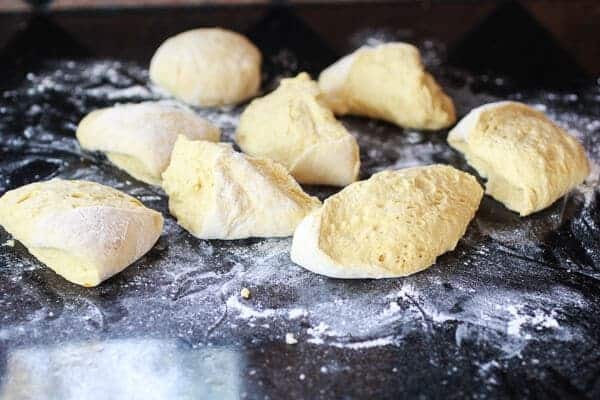 Dump the dough onto a flour surface and divide into six balls (or you can make it even easier and leave it as one big loaf). Place them on a floured baking sheet and let them rise one more time for about an hour. While they rise get a big dutch oven steaming hot and then bake those bowls, cool, and fill em up with soup! If you do not have a big dutch oven you can use a baking stone, and if you don’t have a baking stone you can use a cast iron skillet and if unfortunately you have none of those, than I’m not quite sure of the results, but don’t let that stop you. I am sure the bread would still be good just baked on a HOT baking sheet, but I am not sure it would be super crusty like the ones you see in the photos. I have found that most of time there is nothing like baking bread in cast iron. I swear it works like magic! So good. Crusty on the outside, so sot and flavorful on the inside. 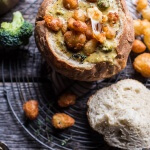 These bread bowls have only the slightest hint of pumpkin, but it makes them perfect for breakfast, sandwiches and any fall soup. They’re also perfectly addicting. Just throw some butter on a fresh slice and you will not be able to stop. It’s so good. These bread bowls have only the slightest hint of pumpkin, but it makes them perfect for breakfast, sandwiches and any fall soup. They're also perfectly addicting. Just throw some butter on a fresh slice and you will not be able to stop. It's so good. Add the flour, salt and yeast to a large mixing bowl. Combine the pumpkin puree with 1/2 cup of the lukewarm water. Whisk until completely combined and smooth. Add the pumpkin mixture and remaining 1 1/2 cups water to the bowl with the flour. Using a wooden spoon mix until you have a wet and sticky dough. If you have a stand mixer you may also do this with your dough hook. Mix until the flour is completely incorporated. Cover the bowl with a wet towel or plastic wrap. Let sit at room temperature out of direct sunlight for 12-18 hours or overnight and up to two days. The dough should bubble up and rise to double its original size. Generously dust a work surface with flour. Scrape the dough out of the bowl and into one mound on top of the floured surface. It should be loose and sticky. Using floured hands, lift the outside edges toward the center, working around the entire piece to make a smooth round ball. 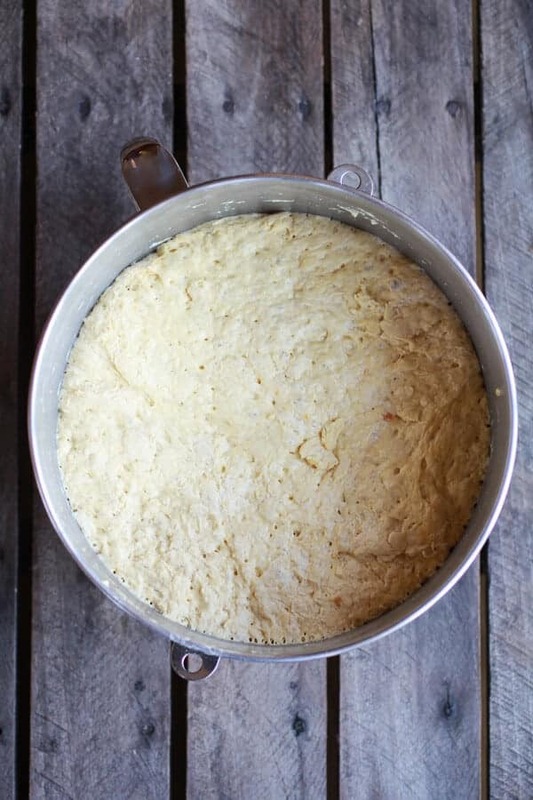 You can leave the dough as one large bread loaf, placing it on a floured baking sheet and covering it with a tea towel. Allow to rise 1-2 hours. Or make individual bread bowls. 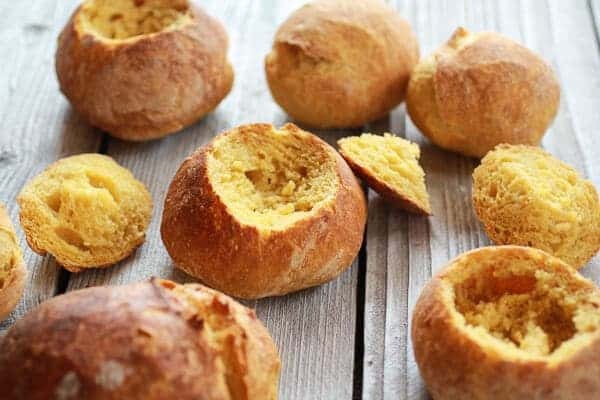 To make bread bowls divide the dough into 6 equal dough balls. 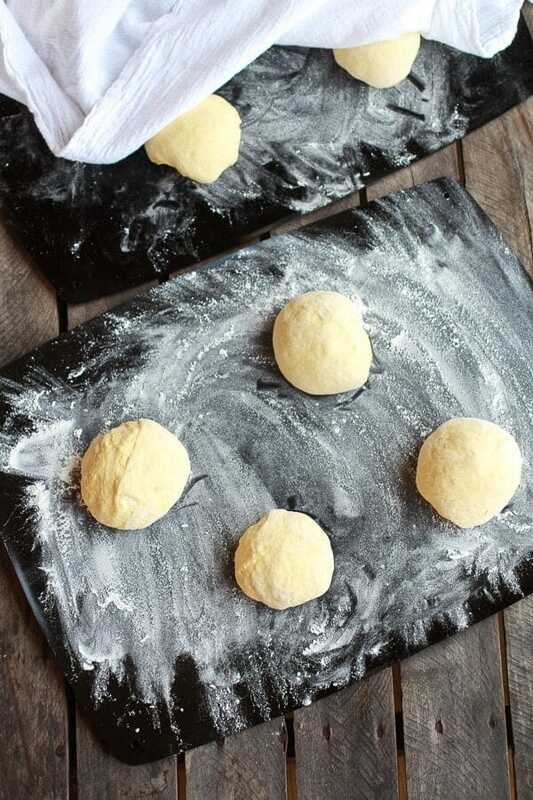 Smooth out into smooth balls and place a few inches apart on a floured baking sheet, covering them with a tea towel. Allow to rise 1-2 hours. Half an hour before the dough is done rising place a rack in the lower third of the oven and preheat to 475 degrees F. Place a 5-quart, or larger, cast iron dutch oven with a tight fitting lid in the center of the rack. You may also use a baking stone, but I have found the the dutch oven with a lid works the best. When the dough is ready to bake, carefully remove the hot dutch oven from the oven using oven mitts and remove the lid. To bake the big loaf: Gently slide your hands under the dough and quickly, but gently and carefully place the dough into the hot pot. Using oven mitts, place the hot lid back on the pot and return to the oven. Bake for 20-25 minutes. Using oven mitts, remove the hot lid and continue baking until the bread is a deep, golden brown, about 15-30 minutes more. Remove from the oven. Using a thin handle of a spatula, carefully lift the bread out of the pot and place it on a rack to cool completely, about 2 hours. Don't slice into the bread right out of the oven, the bread continues to cook as it cools. Eat for dinner, breakfast or as a soup bowl! 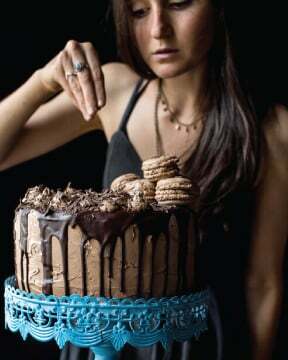 Oh and the winner of the Baked Doughnuts for Everyone Cookbook is Kate M! Nice job! I sent you an email! 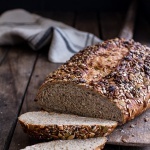 Seeded Whole Grain Breakfast Bread. Cheaters No Knead Dutch Oven Sourdough Bread. Can’t wait to try! Btw I live in Denver, and we do have Panera. 🙂 it’s still delic. Haha! I think Summit county needs a Panera!! Sounds awesome! One question … How big is your Dutch oven? Mine is round and maybe 3 to 4 quarts… When you put three of them in to bake, do they touch? Thanks! Hey Kathy! Mine is big. I think about 9 quarts, but i still think you could probably fit two bowls in at a time. It is kind of a pain, I know. Or you can also just divide the dough in half and bake two loafs instead of six bread bowls. Both ways you are still going to get awesome bread! Hope this helps and let me know if you have any more questions! You know I like simple. Soup would be perfect! Simple is good! Thanks Todd! They’re gorgeous and I love it when I can re-create a restaurant food, only do it better 🙂 I actually did a tomato soup recreation of Panera’s tomato soup about a year ago. I think that soup in these bowls would be perfect. 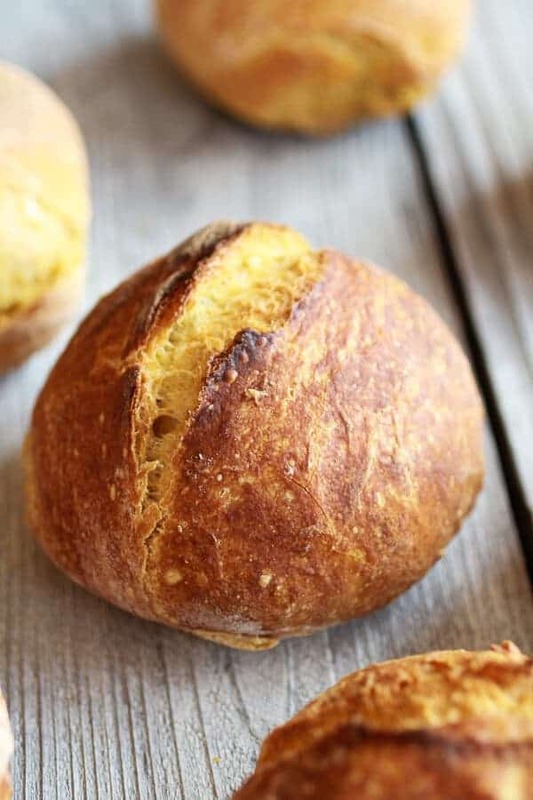 “These bread bowls have only the slightest hint of pumpkin,..” Yes I agree that when I bake yeasted breads with pumpkin, they really don’t get too pumpkiny tasting from the puree alone and I’ve used up to like 3/4 c puree to about 3-4 cups flour. And still the only way to get the classic ‘flavor’ is by jacking up the pumpkin pie and related spices. At least for me. But regardless, the moisture content it adds is amazing! I remember that tomato soup!! Oh I want some now! It looked so good. YUM!! I love these rolls! 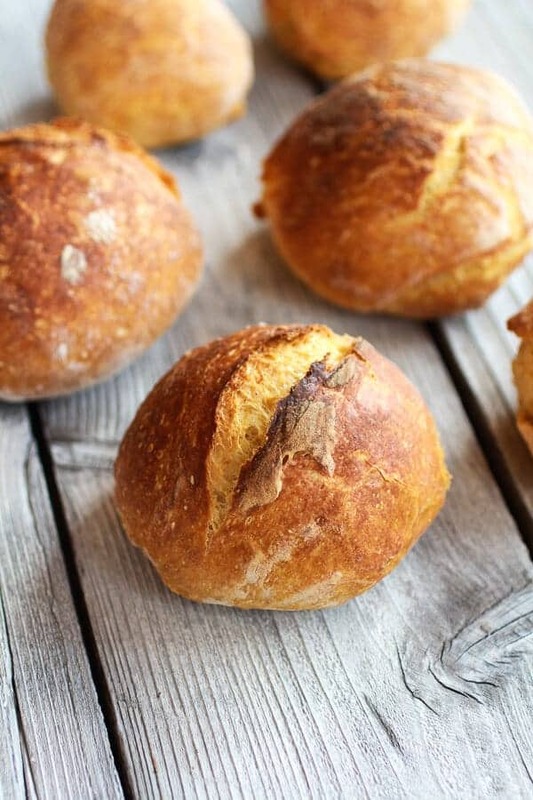 There’s nothing better than the smell of homemade bread! I could not agree more! Thanks Laura! I don’t have a dutch oven, but I do have a baking stone, so that will have to do. Can’t wait to make these. Hope you love them! Thanks Kristi! You do happen to have Panera restaurants in Colorado! These look delish. Can’t wait to make them. Making these for dinner tonight! Yours look perfect! Oh I really hope you love them!! Thanks so much, Amanda! Let me know hoe they turn out! 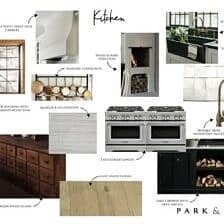 After seeing this on pinterest, very excited about making these. Would be so perfect on a Holiday Buffet. Love it. Thanks Ash! Hope you love them! Fresh baked bread is one of my favorite things ever. I need these in my life! It is so good! Nothing beats fresh bread! Thanks Deborah! Can not wait to try these! So perfect for soup season! Thanks Sarah! Pumpkin soup would be so good in these! Wow look at that crust! Stunning they look so crunchy and beat the smell was amazing when these came out of oven. I think You can try to increase the pumpkin-ness of the bread by pre roasting the pumpkin with a bit of bi carbonate of soda. The chemical reaction in the veggies boost the pumpkin flavour( something like the onions.) Also I like to puree the skin too, the skin has the best flavour. Thanks for the tips Belinda! I actually LOVE the skin too! Thought I was the only one! 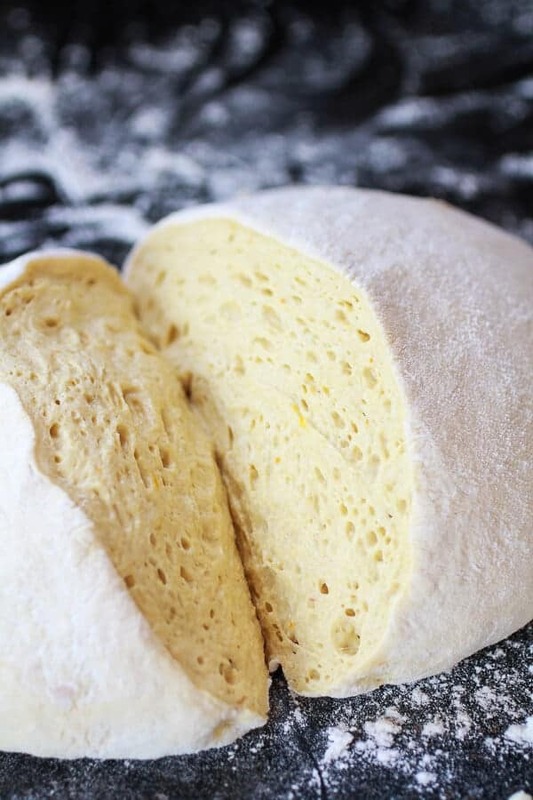 I love no knead bread, it’s just magical. And with pumpkin? Heaven! I might try folding some cranberries or raisins into the dough, too. Cranberries would be awesome I bet!! Thanks so much, Gina! Uh, what?! I expected something with such a deliciously crusty top and fluffy interior to be a little more complicated. This is so beautifully simple! I love it! Ha! I know, but bread it a actually super simple! Thanks Erin! These sound divine!! They could be used in so many ways!!! Genius!! Love, love, love. These look incredible. Can’t believe you only used 5 ingredients to make them… blows my mind! These are absolutely gorgeous. I want one for lunch!! 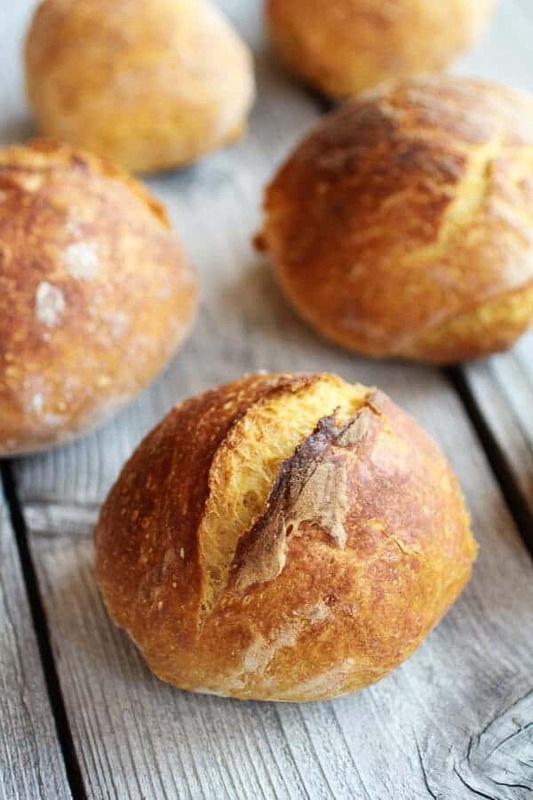 Let’s see…I love pumpkin, and crusty bread, so I know I will love this bread! Your photos are perfection! I’ve never made bread inside a dutch oven! I’m pinning this to my (CarlaINHouston) Recipes to Try and Love board to give it a go–they look absolutely amazing! I’d love to invite you to share this (and anything else pumpkin you’d like!) at the Perfectly Pumpkin Contest–you can see it at http://preschoolpowolpackets.blogspot.com/2013/10/2013-perfectly-pumpkin-contest.html I hope we see you there! My company makes the bread bowl cutters for Panera. They cut the perfect size whole from the bread! Haha! No way! That sounds so cool! I did not even know that was a thing! These are intriguing….I’ve never heard of adding another ingredient to the “yeast sponge”…I’m going to try these this weekend. Incidentally, we vacationed in Frisco in April for a week. Although the weather wasn’t very nice and we couldn’t do a lot of hiking because of all the snow, we thoroughly enjoyed it there! So much so that we are planning to go back in May next year! It was a lovely city, and we liked it best out of all the mountain towns we visited during our stay there. That museum was one of the best we’ve ever been to…very well done. Great city! We love Frisco! It is the perfect town for us! Hope you love these and let me know what you think! Oh and if you need any recommendations for your next visit just let me know! Hey Elaine! No oil, but make sure the bread is well floured before adding it to the hot dutch oven! Hope you love these! 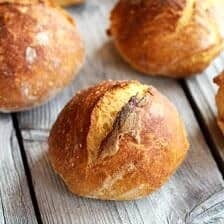 I want to try making these but rather than make a loaf or bread bowls, I am thinking of making rolls. That being said, I don’t own any cast iron pans and all my stone bakingware is Pampered Chef and I don’t think they recommend heating them up and then “plopping” the food to be baked onto/into the hot stoneware, however, I AM going to shoot off an e-mail to my friend who sells it to inquire. I say all that to say this, I have a large (12 in or better) teflon coated, oven safe skillet with straight sides that I could preheat and then place the rolls into to bake. Do you think this would work well to create the crusty, fluffy, yummy rolls I hope it will? I would like to try this for Thanksgiving!! Hey Michelle!! I am honestly not sure how it would work. I think you should try it out once before Thanksgiving to make sure you like the end result. I would think the rolls would just be a little less crusty, but still delicious! Let me know how it goes and if you have any more questions! THanks! Could you substitute applesauce for the pumpkin? I have a hubby who is a meat and potatoes guy and would never eat anything with pumpkin in it. Also, is there a quick recipe like this for Rye bread/rolls? Thanks! Hey Jean! I am not really sure on the applesauce. I would personally not do it and just use the pumpkin. I promise your husband will never know.The pumpkin just adds a soft texture, but not much flavor at all! 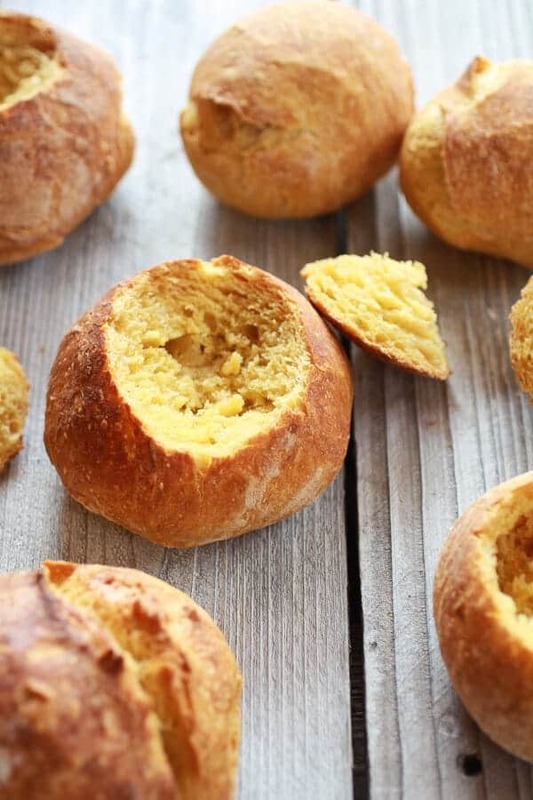 I do not have any rye roll up on my site, but I do have these Easy Fluffy Pull-Apart Whole Wheat Buttery Dinner Rolls that are so good and super easy!! Thanks Jean and let me know if you have any more questions! I use almost same recipe for pumpkin bread but it never occurred to me to transfer it into bowls…It’s a great idea. Now, about using Applesauce, once I replaced it in my pumpkin bread & my 4 yr. old won’t eat it saying I don’t like the taste but pumpkin bread no complaints. What is the procedure for using a stone. I have several and like to bake bread on them. The procedure would be the same. Just place the loafs on the hot baking stone and bake as directed. Hope you love these! I make no-knead bread in a glass casserole dish that has a lid. Works just fine. I have seasoned the inside with oil over time. No need to do it ahead of time. Just spray with oil each time you use it. Beware of helpful husbands who scrub it out with a Brillo pad though. :o) Can’t wait to try the pumpkin in this bread! 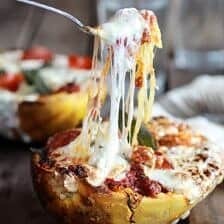 hye, id love to make these they sound great, but unfortunately i don’t have a dutch oven or stone, so I’m wondering how i can make do without? do i have to vary temperature? or brush them with anything before baking? besides that they look great and can’t wait! Hi! I would just bake them on a hot baking sheet that you let preheat in the oven before hand. The crust will not be as crusty, but they will still taste great! Hope you love these and let me know if you have any more questions. Thanks! Hi there! I tried your bread today and I found it hard to shape it like yours. It was way too sticky and it looked like it needed more flour to be shaped. When you say “flour the surface generously”… what do you mean by generously? 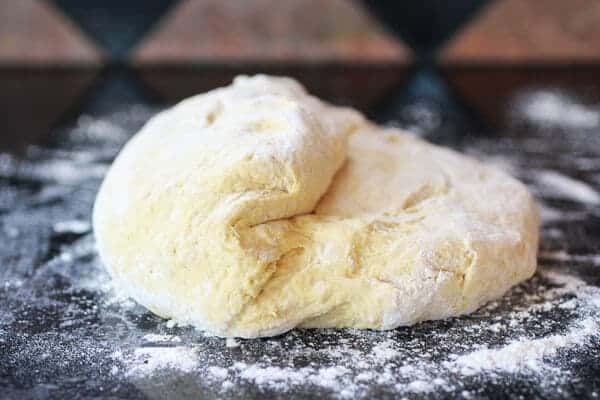 Do you end up adding more flour to the risen dough to help it get that ball shape? It kind of made a low, flattened ball. I’m a huge fan of Jim Lahey and this is very similar to the no knead method he has been preaching since his book was published. I was always a “non baker” until this method came along, and now my family enjoys a variety of fresh baked breads every week. If you haven’t read his book, do so..his pizza dough recipe (similar method) is a revelation!! Just found this recipe. 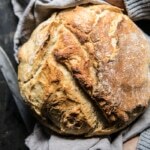 I used to make yeast bread all the time, and loved it! However, recently found out i have antibodies to gluten (celiac blood test), and I feel so much better w/o wheat flour. Since this recipe is no-knead, i dont see why it would not work with Gluten Free AP Flour Blend. Could you please advise? It is a lot of flour to waste, but i could maybe halve the recipe first time? Is it possible to halve a yeast packet and get good results? Thanks! Thank you for such a lovely recipe! 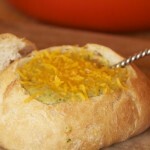 I just made the bread bowls and am going to fill it with some homemade Roasted Red Pepper soup!.. That is of course if the bread bowls survive tomorrow! 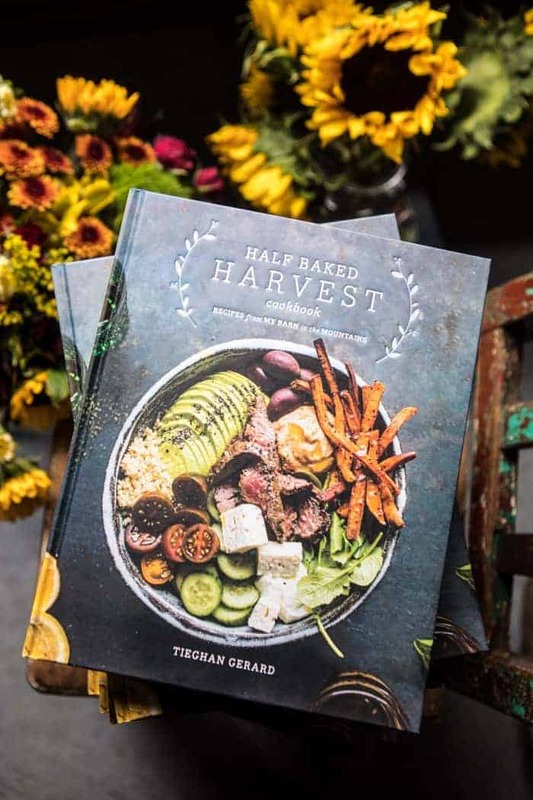 I loved his blog, and this recipe is wonderful. I want to test with sweet potatoes too, it must be delicious. I love making breads at home, thank you and success! Wow, I’m so glad I try to make this recipe here for my love. I hope it goes great for you, Juliano! Enjoy! 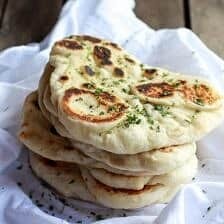 Very good your recipe I love homemade bread I will try to do here because I do not have a good oven but I will try anyway thank you. I hope this turns out great for you! Thanks! Thank you Maria! I am glad you like this! hmmm.. good food recipe. soudns delicius.. i wil try next weekend. Great! I hope you love this! Thank you! This was the first bread recipe I have ever used. I made a loaf last night that was delicious!! Very easy recipe to follow. Thank you so much! Olá! 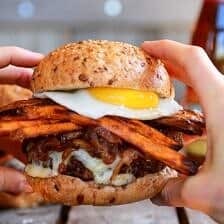 Estou tão feliz que você amou esta receita e espero que seja incrível para sua família! Muito obrigado!